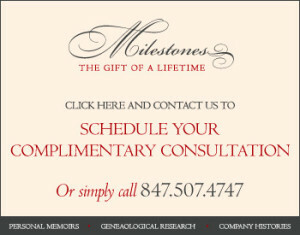 Live in Palm Desert and looking to write your memoirs?Milestones, the Gift of a Lifetime (www.YOURMILESTONES.net) a professional provider of ghostwritten autobiographies based in Indian Wells will get you started. As a resident of Palm Desert you spend considerable time and money securing your assets for future generations. But the most treasured gift you can give loved ones isn’t your wealth. It is the story about your life and family history. Memoirs are the fastest-growing segment of the publishing industry. Notice how memoirs fill the shelves of Palm Desert bookstores. Entire sections are devoted to memoirs and autobiographies. In a series of structured recorded conversations in your Palm Desert home, I will help you write your life story. Bonnie Bell, MSJ, M.Ed, memoir writer and founder of Milestones is a published journalist skilled in the art of interviewing. Based in Indian Wells, Bonnie has more than 20 years experience in writing biographies as a correspondent for People Magazine. Find out more about Milestones, the Gift of a Lifetime and memoir & personal history writing services in Palm Desert, CA 92260.